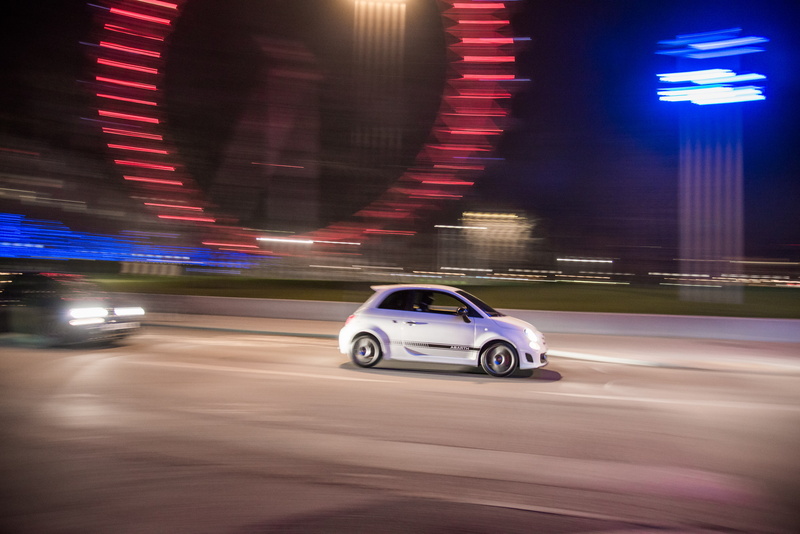 The tyres of the tiny Abarth 595 squeal on the wet cobbled streets as we tear passed Big Ben. The rear-view mirror is filled with the sight of two more pumped-up Italian super-minis – one white, the other blue – their headlights dancing off puddles on the pavements. It’s almost 1am on a bitter winter’s morning, the air is icy cold and the typically dense London traffic has thinned to a slow stream of black cabs. A crackle on the walkie-talkie placed in the door bins attempts to relay some information but our itchy balaclava is making it difficult to comprehend. “Faster… You need to cross the bridge faster,” barks a voice on the radio. The rorty 595 lets out a crackle and a pop as we shift down a gear and swing the car around. It was time for take two. Relax, this wasn’t the moment just before the Flat-Out team was pinched for assisting a bank heist in Britain’s capital; it was the time we were asked to support Abarth’s viral video campaign created to celebrate the launch of its new 124 Spyder sports car. If you didn’t see the final fruits of our labour, we’ll give you a condensed version: three light-fingered chaps pilfer top-secret blueprints from Abarth’s central office in Turin. They then proceed to race across the beautiful Italian landscape towards London, where a mysterious man awaits the stolen files. Finally (cue dramatic music) it’s revealed that the filched folder contains plans for the all-new joint Fiat-Abarth 124 Spyder, the Italian marque’s pumped-up version of the Mazda MX-5. It was an experience we’ll never forget and getting permission to race across the streets of London with a full film crew capturing every moment isn’t one we are offered every day. 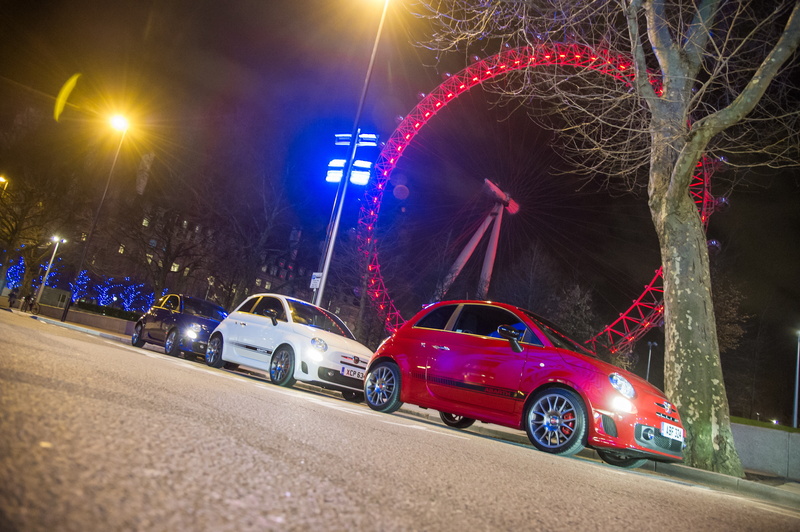 Our chase scene started underneath the iconic London Eye, where we were handed the keys to the 1.4-litre turbocharged micro machine. 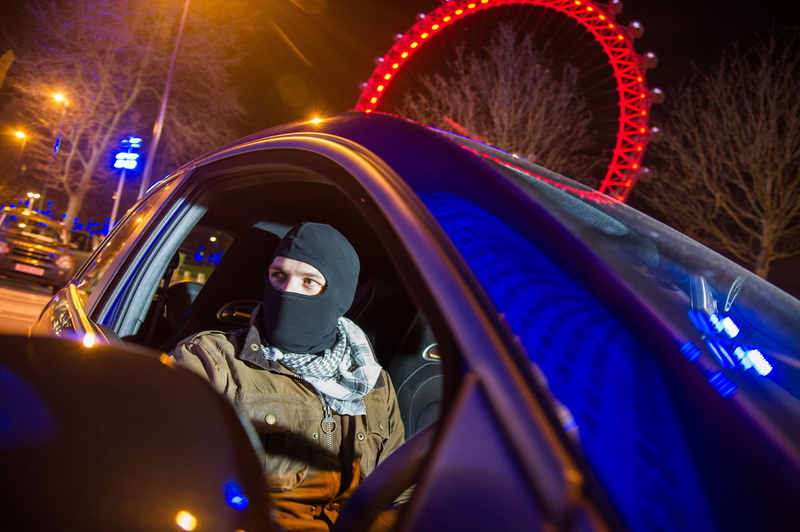 And a black balaclava, hardly our usual driving attire. The Abarth 595 has one of the most distinctive exhaust notes off all the feisty super minis currently on sale and when three are sat idling on an empty road near Embankment, the deep burble alone is enough to make you want to hoon into the wee hours of the morning. The route itself was a whistle-stop tour of London’s landmarks, driving east from the twinkling Ferris wheel, towards the Houses of Parliament before speeding past the Park Plaza Hotel and making a beeline for Horse Guards Parade. At that hour of the morning, the streets were nearly empty and while we weren’t exactly aping scenes from C’était un rendez-vous, we were given ample opportunity to experience the 595’s grin-inducing handling. With many potent hot hatches claiming to have ‘go-kart-like handling’, the phrase has become motoring cliché, but the little Abarth truly earns that badge and then some. At £14,610, it isn’t the cheapest option among its opposition, but the interior is well appointed and its diminutive dimensions mean it is extremely capable at slotting into pint-size city spaces. As far as hilarious metropolitan machines go, the Abarth 595 is on a par with the Polo GTI and the old Renault Twingo RS. 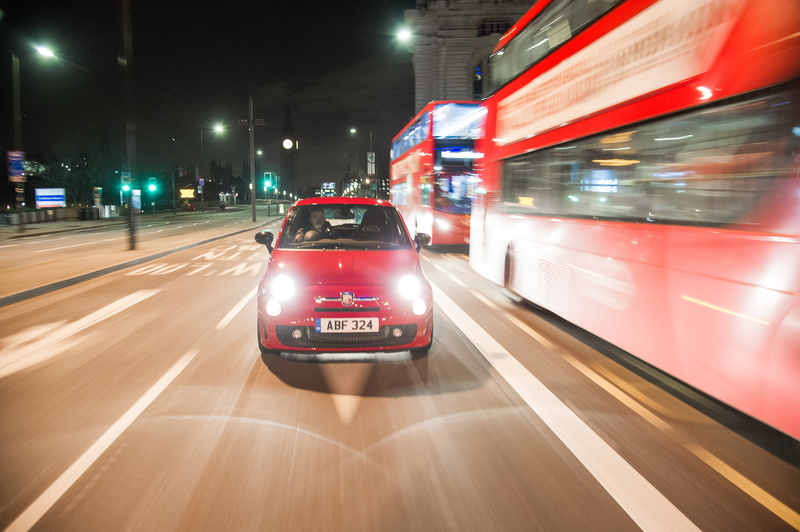 Returning to the shoot, filming in London requires many different permits and Abarth’s time on the city streets is running out. We bag a few more scenes, swapping places with rapid overtaking manoeuvres and cornering hard to impress the camera. While we don’t have time to relieve a bank of its safe, we come away from the evening feeling like we definitely got away with something. It’s not everyday you get to act the fool in front of London’s most iconic landmarks without attracting the attention of the law but we did and these machines felt like the perfect platform for some automotive tomfoolery.